Join the growing number of hospitals who are offering Dhremo Therapy IV Decals as part of their comprehensive cancer care. Dhremo re-frames chemotherapy, for both patients and health care professionals. See what a difference it makes when you give your patients this tool to empower a positive mindset and harness the placebo/ nocebo effect. Integrating Dhremo into your hospital is easy. Watch our training video for tips on applying and talking about Dhremo, and follow the quick reference guide below. Want to offer Dhremo Therapy to your patients? You can now order bulk decal hospital kits including 25, 50 or 100 of each of our pediatric or apothecary decal designs. Like all of our products, 10% of profits are donated to cancer research and support organizations. Below we breakdown the rules in four pharmacy developed easy steps. You can also download a quick-reference guide to print! Decals should be placed on the IV bag by the patient’s nurse, wearing the appropriate PPE (standard or chemotherapy gloves, depending on the medication being infused). Place decals such that there is no obstruction of patient identification labels, drug information, or barcodes and so that there is a 1-inch gap between the bottom of the IV bag and the bottom of the decal. This will allow for visualization of any precipitate. Bags may be hung with the decorative decal facing outward, as long as the nurse can easily view the pharmacy labels on the reverse side. 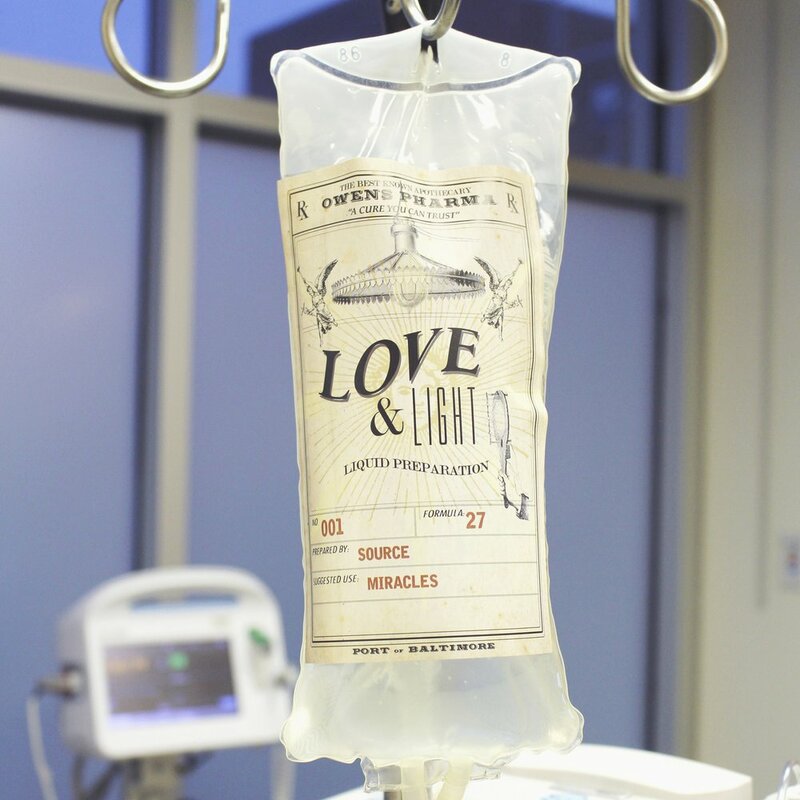 Once applied, decals may not be reused or removed from the IV bag and taken home by the patient, as they may be contaminated with trace amounts of chemotherapy. Decals are not intended for syringes and injectables. Heather Keller, RN, BSN, RYT, CHTP, works with hospitals directly to implement new programs. Set up a call to discuss starting a program in your center. Research continues to point to the power of the mind in healing. Below are links to just a few of these research studies that back our approach. We are currently conducting pilot research on the direct effects of Dhremo IV Decals with both pediatric and adult patients in partnership with Lifebridge Health and the Children’s Hospital of Orange County. We look forward to sharing more as we gather data. Germann, J. N. , Leonard, D. , Stuenzi, T. J. , Pop, R. B. , Stewart, S. M., Leavey, P. J.; University of Texas. adjustment, well-being, and quality of life." Research that supports the notion of 'mind over matter'. Research shows how perception of stress as negative or positive can impact influence on our physical health. Emotional stressors contribute to oncology nurses having a higher risk than the normal risk of compassion fatigue and burnout. Virtual reality as a distraction intervention for women receiving chemotherapy, Oncol Nurs Forum, 31(1):81-8. Schneider, S. , et. al. Nursing interventions that utilize virtual reality can be an effective way to reduct symptom distress and have a better way to cope. Improving oncology nurses' communication skills for difficult conversations. Clin J Oncol Nurs, 17(3): E45-51. doi: 10. 1188/13. CJON. E45-E51. Nurses with strong communication skills enhance patient satisfaction and even improved clinical outcomes. Nurses recognize need for skill development and practice. Evaluation of an integrated communication skills training program for nurses in cancer care in Beijing, China. Nurs Res, 56(3):202-9. Liu J. , Mok E, Wong T, Xue L, Xu B.. Effectively dealing with patient and family distress, requires nurses to have communication skills and strategies to cope with difficult emotions, reactions or questions. Nursing education seems to be insufficient in equipping nurses with adequate tools and practice in therapeutic communication. The ways in which we think and believe has an impact on how our physical body will respond and what we experience. Milanti A, Metsala E, Hannula L. Reducing psychological distress in patients undergoing chemotherapy. Br J Nurs. 2016;25(4):S25-30. Milanti A1, Metsälä E2, Hannula L3. Psycho-educational intervention with positive reappraisal and relaxation provided to patients experienced significantly lower distress levels than the control group. Zainal NZ, Booth S, Huppert FA. The efficacy of mindfulness-based stress reduction on mental health of breast cancer patients: a meta-analysis. Psychooncology. 2013;22(7):1457-1465. Zainal NZ, Booth S, Huppert FA. Significant mental health improvement was shown in breast cancer patients who participated in a mindfulness based stress reduction program. Mindfulness significantly reduces self-reported levels of anxiety and depression: results of a randomised controlled trial among 336 Danish women treated for stage I-III breast cancer. Eur J Cancer. 2013;49(6):1365-1373. Wurtzen H, Dalton SO, Elsass P, et al. An 8 week Mindfulness-based stress reduction program included in treatment for breast cancer patients significantly reduced self reported levels of anxiety and depression. Jensen CG, Elsass P, Neustrup L, et al. What to listen for in the consultation. Breast cancer patients' own focus on talking about acceptance-based psychological coping predicts decreased psychological distress and depression. Patient Educ Couns. 2014;97(2):165-172. Jensen CG, Elsass P, Neustrup L, et al. Acceptance based coping skills linked to lower depressive symptoms and distress in patients. Hospitals around the country are supporting their patients by providing Dhremo Therapy IV Decals. Here are just a few, but the list is growing every day!